Although the term was coined for the probiotic supplements, the art of eating fermented foods and soluble fiber is not new. The fermented foods are a source of probiotics, and the prebiotic foods are the source of soluble fiber, the prefered food for your probiotic bacteria. As I grew up in Eastern Europe, I always heard people saying that certain foods are going well together. I never really understood why, and if you asked the people who were saying it, I doubt they knew. Except my math teacher, who was the smartest, and most interesting person of my childhood. She firstly opened my eyes when she opened a discussion about Romanian eating habits. At the time, there wasn’t much research about soluble fiber, and microbial flora, yet she had this intuition about pairing foods to enhance food absorption and improve health, in general. And if you wonder what kind of school was that, where you discussed food during a math class, well that was our math teacher; she would have, from time to time, a nice 10 minutes discussion with us, (math unrelated), to make us think, to open our minds. So when I was young I always heard phrases like “These beans work with pickles”. Typically pickles meant sour pickles, and not the vinegar ones. Or I would hear “I have a terrible hangover, do we have some sauerkraut juice?”. All these culinary and food pairing traditions have a solid foundation, they are not just useless combinations. Food pairing is based on three major concepts, flavor based foodpairing, pairing foods for nutrition, which don’t make the object of this article, and finally pairing foods for health, which we will discuss following. More exactly, we will discuss pairing fermented foods and prebiotics, to enhance the effects of the microbiota, and to minimise the effects of fiber on our stomach. As an example, I will go back to the saying, “Those beans go well with pickles.” The beans, as all legumes contain a lot of soluble fiber. Soluble fiber in beans can give us some stomach problems, because of the fiber content. If we eat them with a fermented food, such as sour pickles, which is very rich in probiotics, you will get a few immediate benefits, you will ease the stomach problems associated with prebiotics, you will provide additional prebiotic fiber for the probiotics to feed on, and as a result of the two, you will increase the protein absorption from the beans. Great, isn’t it? Combining probiotics and prebiotics in foods to enhance the effect of the cultured foods, creates a synergy between the two elements, and the combination is called synbiotic. Although the term was coined for probiotic supplements, where the pill/capsule was supplemented with prebiotic fiber, (most commonly used is inulin), the use of probiotic synergistic food combination is actually cheaper, and in many cases even more effective. The World of Gastroenterology has put together a nice document about probiotics and prebiotics here. The following list is not exhaustive, and you can use your imagination and test your own pairings. Some foods make sense in theory, but they don’t blend well gastronomically. If you are one of those people who eats anything, the taste and smell combination will not deter you from making the weirdest combination, but if you are like me, and you still want your food to look and taste like food, you will avoid weird. My favourite combination is kefir with sea buckthorn and honey. Kefir is one of the most potent probiotic foods. It contains a few times more probiotic strains than yogurt, and it tastes better, though taste is very subjective. Honey contains oligosaccharides a prebiotic fiber that stimulates bifidobacteria and other probiotics. Sea buckthorn also contains prebiotic fiber, but also antioxidants and phytochemicals. The mix creates the perfect synergy resulting from the interaction of the probiotics with the antioxidants and the prebiotics. There is term coined for this mix – Phytosynbiotics. Why sea buckthorn? Check my article about this wonderful berry, and you’ll understand. If you want to create your own synbiotic food pairing, start from the two lists I put together, the list of probiotic foods, and the list of prebiotic foods. I can’t promise that pairing foods rich in dietary fiber and fermented foods will improve your Irritable Bowel Syndrome symptoms, or reduce your Ulcerative Colitis, but it just makes sense that if this works with supplements, to work with foods as well. There is scientific evidence that using synbiotic blends of prebiotics and probiotics in a supplement will improve the symptoms. Here is one study about synbiotic therapy. This study shows that combining bifidobacterium longum with inulin and oligofructose prebiotics can reduce the chronic inflammation in cases of ulcerative colitis. Oligofructose stimulates calcium absorption according to this article on nutrition.org, the mechanism is explained by the increase in the microbial gut flora, and the fermentation of the FOS in the intestinal area. This fermentation decreases the PH, and in a more acidic environment the calcium absorption increases. Of course, the best way to benefit from synbiotics, is to eat both prebiotic and probiotic foods, but as we saw, the science says that not all soluble fibers go well with all probiotics, and there is a a little science involved. If you don’t have major health issue, you can try to experiment, as I do, combining foods in various pairings. However, if you need to fix a health problem, just use a synbiotic supplement that is already tested, and works. ProSynbiotic contains 4 of the best known, and researched probiotic strains, with the support of two prebiotic fibers, in a synbiotic blend, to support gut flora and the health of the intestines in general. 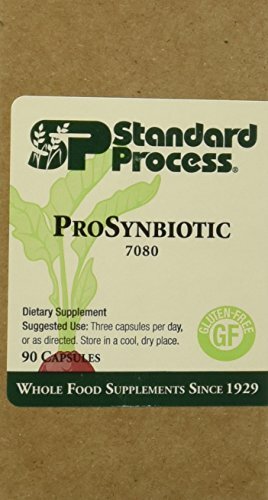 The ProSynbiotic is formulated by the company Standard Process, and the blend contains lactic acid bacteria (Lactobacillus acidophilus, Lactobacillus paracasei, Bifidobacterium lactis), and Saccharomyces cerevisiae var. boulardii. The prebiotic content is composed of inulin, and galacto-oligosaccharide (GOS). Both of the prebiotic fibers are well known to boost the probiotic bacteria's growth and multiplication. Probiotic manufacturers have started to add soluble fiber to their supplements, to increase the efficiency of their products. While this is a great step in the right direction, many times the added prebiotic fiber doesn't do anything. Sometimes the fiber is just too little to have any effect. Other times the fiber is not right for the probiotic. Taking a commercial synbiotic can drastically improve your condition. Once you get better, though, don't rely solely on supplements. Start by creating your own synbiotic foods. The most benefits you will get when you have a variety of prebiotics and probiotics. Our microbiome is very diversified, and we need to nurture this diversification. When you start introducing synbiotic foods, you don't need to take all the fermented foods and soluble fibers at once. Just eat a variety of them on a regular basis. Check our list of prebiotic foods. The list contains foods with various soluble fibers. Each of the fibers stimulate certain bacteria strains. Also check our fermented foods page. Various fermented foods contain different probiotics strains. So you want to diversify this list. @edie, Your question is very vague. What synbiotic combination are we talking about? There is very little research in the field, and is mostly done by commercial institutions. As such, the ratios between components are protected by their inventors. Use common sense for a starting point, then fine tune.